Enforta (or Энфорта with cyrillic letters) is a Russian telecommunications operator, mainly targeting businesses and professionals. On Monday, August 29, it introduced a new corporate identity. The new look should be "more contemporary, reflecting the expertise and professionalism" within the company. It also introduces a new graphical element that should represent the company's wide coverage. The six Arts and Culture Centres operated by the government in the Canadian province Newfoundland and Labrador got a new look last week, which included a new website and a new logo. The hope is that the new look and the improved website will increase attendance at the under-utilized centres. At the moment, Poland holds the rotating presidency of the European Union. Next in line is Denmark, who are taking over on January 1. While Poland unveiled their presidency logo in May, Denmark announced their logo over a year before taking the presidency. The Ministry of Foreign Affairs and the Danish Design Centre (DDC) arranged a contest to select the presidency logo, and the winner was presented on October 11, 2010. The contest attracted 71 submissions from designers and graphic artists, and the winner was selected from seven finalists. The winning submission was created by Peter Jacob Møgelvang from Kunde&Co. A jury statement described it as "an aesthetic and creative typographic solution, which in its simplicity is a clear expression of Danish design tradition". The "half-digits" represent the Danish half year at the presidency, and rotating digit represents the rotating nature of the presidency. The Ore Mountains, or Erzgebirge as they are called in German, form the northern part of the border between Germany and the Czech Republic. The districts located on the German side of the mountains operate the tourism marketing organisation Tourismusverband Erzgebirge. Last week, on August 23, they unveiled a new tourism logo. As a reminder of the region's mining tradition, the new logo introduces a crossed hammer and pick symbol with eleven different colours. A less colourful rendition of this symbol can be seen in the coats of arms of some towns in the region. The typeface used for the name is Palatino Sans Bold. The logo comes with a new tagline, "Die Erlebnisheimat" which means "The Adventure Homeland". The Dresden agency Sandstein developed the logo and a new brand strategy, as reported by Design Tagebuch. The rollout new digital TV channels continues in Europe. The latest hatchling from the dominant Italian broadcaster Mediaset is Italia 2, an entertainment channel that targets young men. The channel launched on July 4 and is spin-off from the popular Italia 1 network, which explains the name. The logo for the new channel is also based on the Italia 1 logo. The Italia 1 logo was introduced in the early 1980s. 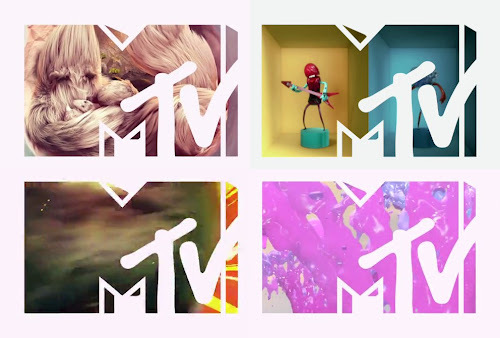 On July 1, MTV introduced its updated cropped logo in most markets outside the United States. This also meant that the existing identity interstitials shown between programmes were replaced by a new set. The previous "Pop x 1000%" IDs had been introduced with the previous rebrand in 2009 and were all created with Matt Pyke's Universal Everything. There is an exciting case study available on Universal Everything's website if you want to explore it further. This time, MTV World Design Studio (MTV WDS) in Milan turned to several independent motion studios from different countries to create new 20 second interstitials. Four IDs were used from the start, while two more are scheduled to be released later on. The effort was led by MTV WDS creative director Roberto Bagatti. UK sound designer Al Boorman (Wevie) is credited with the music in all the new IDs. Intrax, a company that provides global educational programs, like foreign exchange students, au pairs and language education, has introduced a new corporate identity. It was created by MetaDesign in San Francisco. "MetaDesign worked with the executive team and leadership of marketing and sales to develop the essence of the Intrax brand, architecture of the brand portfolio and a new visual identity system representing the concept of "connections". The logo features a customized typeface with distinct inflections that demonstrate ‘connections’. The most prominent feature of the logo is the letter “x,” from which an arrow shape has been derived and assigned a complementary color. This arrow symbolizes the personal and professional direction, as well as the forward-looking outlook, that Intrax program participants gain. A highly systemic and versatile design system was developed in conjunction with the logo. An angular graphic device reiterates the concept of connections and direction, giving the brand a dynamic and compelling visual language." Two of the programs offered by Intrax (Ayusa and AupairCare) have visual identities that match Intrax, and they have maintained that link. This week, the American insurance and financial servies company Unitrin changed its name to Kemper Corporation, taking the name of its Kemper insurance division. Unitrin bought Kemper's personal lines and casualty insurance business in 2002, and last year they also bought the full name rights, which had until then been owned by Lumbermens Mutual Casualty Company. The new corporate identity was created with Lippincott. The Kemper division will be renamed Kemper Preferred, while the other divisions, Unitrin Specialty and Unitrin Direct, will apparently not be renamed, at least not for now. A press release about the namechange was published on August 15, while the renaming officially took place yesterday, August 25. The Colombian financial group BCSC was formed some years ago from the merger of Banco Caja Social and Banco Colmena (colmena meaning "hive"). The two bank networks did however continue to operate under separate brands until this week, when they united under one common name, Banco Caja Social. Previous logo for Banco Caja Social BCSC. Previous logo for Colmena BCSC. The rebrand introduces a new pointsymmetric symbol made up of red and blue spots. It is heavily used in ads and on the new website. As it tries to regain lost market share and connect with younger costumers, the South African short term insurance company Mutual & Federal launched a new corporate identity this month. Tracing its history all the way back to 1831, Mutual & Federal got its current name in 1970s when the Old Mutual insurance group became involved in the company. Today Mutual & Federal is a sudsidiary of Old Mutual, and the new logo adopts the same typeface as the Old Mutual logo. The green colour, which was also present in the previous logo, is also shared with Old Mutual. The previous logo contained a silhouette of Table Mountain that overlooks Cape Town. Replacing it allows Mutual & Federal to create a brand identity that can be used across Southern Africa, as the company also has activities in Botswana and Namibia. Sats is a chain of fitness clubs (gyms) in the Nordic countries (Denmark, Norway, Sweden and Finland). At the beginning of this year, it started implementing in a new corporate identity across the company. Behind the new look was the Swedish brand agency Essen. While the previous identity was well-known, it was felt that it wasn't energetic or flexible enough. The new identity builds on the visual equities of the predecessor, infusing energy and flexiblity to create a consistent visual language that reflects the company's culture. A few glimpses of the new look could be seen last year in Norway, with a full scale rebrand starting in early January. The previous logo was an orange rhombus with the name in the middle, with dots between the letters as if SATS was an acronym (which it may have been at some point). The new updated wordmark leans forward to "express more energy". It can be used both with the rhombus and by itself. There is also a rasterized version of the wordmark, and the rhombus shape can be used on its own as a graphical element. Essen also created new colours, a typographic solution and a bunch of sports-related pictograms. SCORE, which used to mean Service Corps of Retired Executives, is an American nonprofit organization that provides mentoring to small businesses. Earlier this year, the company laucnched a new logo, which contained a "helping hand" and the new slogan "For the Life of Your Business"
The new logo has been around for a few months, at least since May. The French cable channel RTL9 can trace its history back to the French-language television service of Luxemburg's official broadcaster, founded in the 1950s. Today, it is a general entertainment channel targeting the French-speaking countries, and has often been able to claim the position as the most watched cable-satellite channel in France. On August 29, RTL9 is launching a new look that will see it replacing the "geometrical shapes" logo it has used in various forms since the 1990s, with four rectangles. The new logo is described as "faithful to the values of the channel", and keeps the "vibrant colours" from the previous logo, representing a diverse programming range for the entire family. The new look was created by a French motion design agency called Télévision. The first version of the "shapes" logo was introduced at some point during the first half of the 1990s. The yellow square was added when the channel changed its name from RTL TV to RTL9, and the bevel effect was introduced around the middle of the last decade. Mäklarhuset is a Swedish real estate agency chain, which claims to be the third largest realtor in the country. Last Friday, it launched a new corporate identity, with a new swirling wordmark. Pinellas County is county in Florida which is a part of what is called the Tampa Bay Area. The county is marketed by an official tourism marketing organization called St. Petersburg/Clearwater Area Convention & Visitors Bureau. It is named after the two largest cities in the county, and those two names are also used when marketing the county. Late January this year, a new identity was launched for the area, created by a team at Pentagram in New York. The previous identity was launched around October 2007 when the St. Petersburg/Clearwater Convention and Visitors Bureau changed its brand name to Visit St. Pete Clearwater. Choosing from several possible symbols, Pentagram's Michael Bierut and Joe Marianek settled on a round symbol with swirls that can represent "breaking waves and bright sun" as well as the initials S, P and C. This is combined with the Mr Eaves typeface. Visit St. Pete Clearwater first published the new identity on their Facebook page on January 27, announcing a bus ad campaign that would start in New York City that same weekend. Pentagram tweeted about this on January 28, publishing a case study on March 11. The official Visit St. Pete Clearwater site wasn't updated until several months after the new logo first appeared. Last Friday, August 19, the University of San Francisco (USF) unveiled its new visual identity, along with a new tagline, "Change the World From Here". The overhauled identity was created by San Francisco design agency Studio Hinrichs and USF's Dale Johnston, and was developed over eighteen months. The previous logo, dubbed the "cross USF logo", was allegedly introduced in 1994 and designed by Landor Associates. It contained a "budded cross" and the initials in a green rectangle. Three-letter acronyms are generic and confusing, and most of the new logos only use the university's full name, to enforce the university's own identity and its connection to the city where it is located. USF is a Jesuit Catholic university, and like its predecessors, the new logo includes a cross, although it is now less on-the-nose, and has been hidden in a symbol made up of arrows. They point both inward and outward "reflecting the ongoing dialogue and engagement between the university and society". As is costumary with university identies there are dozens of lockups of text and symbol for different uses. The logo on the top of this page is the main version, a few others are presented below. Hamburg-Köln-Express (HKX) is a new private German train operator which will challenge the incumbent operator DB. Its traffic start has been postponed several times, but is now scheduled to take place in December, when traffic between Cologne and Hamburg will commence. Last month, the company unveiled its logo and train livery. The colour scheme is dominated by bright orange and dark purple, contrasting the red-white DB colours. The logo combines a geometrical "modern" lettermark partly made up of "bracket" elements for the HKX abbreviation with the "classic" Clarendon Light typeface for the full name wordmark. This creates a nice contrast, and the bracket elements and the Clarenden typeface are used in other identity applications, such as train liveries. Two examples of train car interiors and exteriors can be found in the links below. Warsaw Modlin Airport is a Polish former military airfield which is in the process of being converted into a civil airport, scheduled to be opened before the 2012 European Football Championship. Tailored to serve low-cost carriers, it will be the second airport in Warsaw, after the much larger Chopin Airport. On Friday, August 19, the airport unveiled its logo with a "modern and fresh look". The round symbol contains references to local folklore, the airport's location and air travel. The blue intersecting lines represent the confluence of the rivers Narew and Vistula, where Modlin is located. Naturally, the blue colour represents the rivers, while the green represents the surrounding nature. The pink elements should "symbolize the airport as a modern and friendly place". The logo is credited to the Polish design agency SaltPepper Brand Design. Swiss International Air Lines, the flag carrier formed in 2002 after bankruptcy of Swissair, announced yesterday that it would be "sharpening its brand profile". This involves new corporate logos and a tagline that will be introduced from October. Swiss' current brand identity was developed by Tyler Brûlé's Winkreative when the airline launched in 2002, and it appears the livery developed then will remain in use. The update is merely aligning the corporate logo with the livery, replacing the red squares used until now with the Swiss tailfin. The intent is to make Swiss instantly recognisable as "the airline of Switzerland", and a tailfin with the Swiss cross is arguably the first thing that comes to mind when one tries to visualise that. Toastmasters International, the nonprofit that helps its members with public speaking and leadership, is getting a new look. The new visual identity was unveiled on Wednesday, August 17, at the Toastmasters International Convention in Las Vegas. Toastmasters claims this is their first brand update in 70 years. The previous emblem with the cross-layed gavels has been very much simplified, and we're left with a corporate-looking logo with a globe and the name of the organization in the center. The updates are done "to make Toastmasters’ identity clearer, increase awareness of its impact around the world and focus more on leadership". Petco, the U.S. nationwide chain of pet stores with over 1,000 locations, announced yesterday, August 17, that they were introducing a new tagline and an updated logo. The tagline changes from "where the pets go" to "where healthy pets go", reflecting a change in direction wtih emphasis on healthy and organic products. The logo itself has been updated by switching to lowercase. The dog and the cat, who are called "Red Ruff" and "Blue Mews", are slightly redesigned to give them a more natural look. The new look and brand strategy was developed by Lippincott with Petco's in-house team. Petco will start installing new signs this month. A "larger rollout" is planned for October when the company celebrates its anniversary. Beam Global Spirits & Wine is an Illinois-based premium liquor company with several well-known global brands, the most famous of which is Jim Beam whiskey. As its owner, Fortune Brands, is intending to spin it off as a separate company, this week, the company unveiled a new name and corporate identity. The descriptors in the name are chopped off, and the company will now simply be known as Beam Inc. The previous logo, which featured an ornamental B in a red seal, is replaced by the word "Beam", based on the signature of James B. Beam, the distiller after whom the Jim Beam whiskey is named. The new corporate identity will launch when Beam is separated from Fortune Brands, and that is scheduled for Q4. This spring, the multinational consumer products company Unilever rebranded its high-fat margarine range in a few markets. Unilever has another range of margarines intended at lowering people's blood cholesterol, which is also getting a visual refresh. Internally, this product line is called "Healthy Heart", but to consumers these margarine are marketed under the names Becel (many European markets, Latin America and Canada), Flora (most anglo-saxon markets and Spain), Promise (United States) and Fruit d'Or (France). There is even more international variation when it comes to the lettering in the logo and the packaging, and the brand design formula seems to change somewhat now and then. For the last few years, the brand seems to have settled on a logo design featuring two ovals, one yellow, and one white with blue outline, with the local logotype on top. Recently, probably at some point at the beginning of this year, Unilever started updating the logos again. This time the ovals have been replaced by a more literal outline of a heart. A quick look through various Unilever websites suggests the updated look has so far been introduced in several European markets, including the United Kingdom, France, Germany, the Netherlands, Belgium and Sweden. Sometimes, the logo change has been accompanied by an overall packaging redesign, sometimes the new logo has simply been swapped for the old one.